resources, delivery, support & ease of access & use. You can get an Internationally Accepted professional qualification from the comfort of your home at a very affordable cost. You can do the entire course – start to finish i.e. from application to certification online. Access to a computer/laptop with Internet access. Even access to a cyber cafe will do. 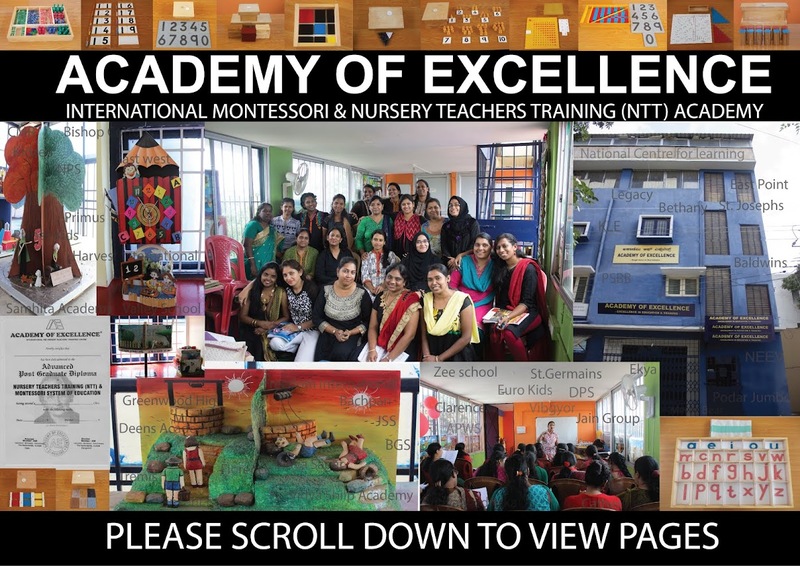 If you would like to do the NTT/MONTESSORI COURSE online please follow the following procedure. · Send an email to enquiry@academyofexcellenceinternational.com with your name, age, education, full postal address, phone numbers & email id. · On receipt of the same we will mail you the course structure & the latest fee details. On receiving the same if you desire to enroll for the course,please send us a mail requesting for the application form & instructions sheet. · Threreafter,please fill in the form & submit it with the required documents, photo & payment so as to reach us before the due date. · The documents can either be sent by courier/post or preferably as scanned copies. Similarly do so with the photograph. · The payment may be made by cash at our centres or you can mail a cheque/demand draft payable at Bangalore or preferably you can make an online NEFT transfer to our account. · We shall then on or before the due date send you an electronic copy of the study material. Please note that if the fees are paid in installments, the study material too will be sent in installments. · On receiving the full colour & well illustrated study material please read & understand it. If you have any doubts/queries/etc please join the periodic chat that is organised. · Complete the assignment/project & electronically mail it to us so as to reach us on or before the due date. · If you desire additional resources-audios/videos/powerpoint presentations/ albums/books/etc, you may purchase the same by making the required payment by cash/ cheque /DD /NEFT. Students may also attend our sessions in Bangalore by choosing the sessions of their choice & making the required payment by cash on the day of the session. · On or before the due date we will electronically dispatch the final evaluation paper with detailed instructions. Please follow the given instructions, complete the needed responses & electronically mail us your output for evaluation & grading. · On receiving the same, the responses will be evaluated & successful candidates will be mailed an electronic copy of their certificate. Those desiring a hard copy may request so with the payment that will be intimated for delivery anywhere in India. For delivery outside of India, please enquire about the cost. · Thereafter, should you need assistance for placement in Bangalore city, please send us an email & we will offer you 100% FREE placement help (only for students doing the advanced course). · So, make the first step to change lives, starting with yours, immediately.